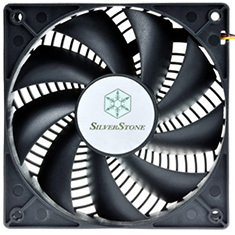 The AP122 combines two classic SilverStone fan designs into one with 9-blade design and the Air Penetrator grille. The result is a quiet 120mm fan with increased airflow rating and lower noise level than the original AP121, but with sacrifice to air pressure. For those looking to add an air channeling fan into cases with less resistance, the AP122 is a great alternative.